Taunton Titans remain top of National Two South as they battled to victory over Canterbury at Hyde Park. Tony Yapp’s men were made to work hard for their eighth win of the campaign against a Canterbury side that came into the fixture on the back of six straight wins. Second placed Chinnor also had to fight for their latest victory as newly promoted Broadstreet proved to a be a stern test for Matt Williams’ side. Also in the top half, Cinderford, Redingensians, Redruth, Bury St Edmunds and Henley Hawks all picked up victories as no side in the bottom eight tasted that winning feeling in Round Eight other than Barnstaple who beat London Irish Wild Geese. Taunton Titans held on to beat Canterbury and maintain their 100 per cent record this season in National Two South. The hosts took an early 12-0 lead after tries from Freddie Fraser and Tom Popham. But on their first real venture to the Taunton line, Canterbury’s Dan Smart crossed to make it 12-7 at the break. A nice try from Harry Sayers saw the visitors take the lead just after half-time, but Taunton capitalised on a Canterbury yellow card to go in front once again as Ratu Vakalutukali smashed his way through the defence to score. The tables were then turned when Aron Struminski was sent to the bin for Taunton and although Canterbury pounded the hosts’ line, Tony Yapp’s men were able to stand firm and hold on for the win. Ben Turner’s late try clinched victory for Chinnor against Broadstreet in an intriguing match at Ivor Preece Fields. The hosts edged their way into a 14-7 lead courtesy of tries from Kieran Goss and Orisi Nawaqaliva, while Street were awarded a penalty try. After the break, Paul Hurst’s men levelled the game up with a George Walsh score, but Greg Goodfellow and Rory Mason put Chinnor 12 points ahead. However, another penalty try to Broadstreet may have unsettled Chinnor, but the away side finally had the win in the bag when Turner went over at the death. Cinderford secured a bonus-point victory at the Slade to consign Tonbridge Juddians to a third defeat of the season. Tries from Reuben Norville and Harry Hone helped Cinderford to a 14-8 half-time lead, with Charlie Edwards crossing after a strong start by the home side. Liam Hemming touched down to extend the lead to 21-8 after the break before Hone and replacement Roger Birkin both went over. Tonbridge Juddians kept on fighting and deserved a late try through Will Colderick, but the damage was done early in the second period. Redingensians battled to a third straight victory to stay fifth in the division, following this win over new boys Old Redcliffians. After Jones’ opening try for the visitors, Redingensians hit back through Steve Bryant and Greg Illingworth. Old Redcliffians came out fighting after the interval and a close range try brought the scores level. Jak Rossiter and Henry Bird then exchanged tries, but a touch down from Will Morrison and a penalty try gave the Rams a comfortable advantage which they never relinquished. Dan Fry grabbed a bonus-point score for OR’s right at the end, but despite their best efforts, their wait for a first win of the campaign continues. Redruth eased to their fifth straight home win of the season, running in five tries against Clifton at the Recreation Ground. After Clifton had taken an early lead through the boot of Bradley Barnes, Redruth hit back in style. Edward Pascoe (2) and Matt Bowden crossed for first-half scores, with Jess Tompsett and Richard Brown adding further touchdowns. Ashley Hosking kicked four conversions and a penalty for the Reds who maintained their excellent home form. Bury St Edmunds continued their impressive recent performances as they clinched victory at the expense of Worthing Raiders in Suffolk. After Kemp Price’s double had given Worthing an early lead, the home side were able to level the scores up at 15-15 by the break thanks to tries from Dan Swithenbank and Will Scholes. Worthing’s Hameed Ajayi was yellow-carded just before Scholes’ score and Bury took full advantage of his absence soon after half-time as Dwayne Corcoran and Boyd Rouse both crossed. Corcoran was on hand to grab his second try on 70 minutes which ultimately won the game for the hosts, but they were given a scare by Worthing who fought back to earn two bonus-points following Price’s hat-trick and a Matt Walsh touchdown. Henley Hawks stretched their unbeaten run to four matches in style with a convincing nine-try thrashing of Wimbledon at Barham Road. The visitors raced into a 26-point lead and began the second period 31-12 ahead against a Wimbledon side that is still searching for their first ever win at this level. The hosts were once again showing their attacking brand of rugby and they reduced Henley’s lead to just five points early in the second period, but the Hawks put their foot down once again as they scored four unanswered tries to seal the victory. 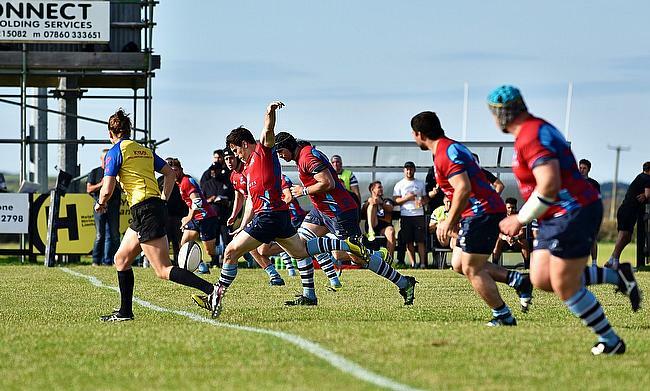 Barnstaple shut down London Irish Wild Geese to make it back to back home victories. Strom Brian played a major part in this contest as conditions at Pottington Road were atrocious, but it was the home side that were able to clinch the win. In a tight game, it came down to decisive scores from Rob Dugard and Gareth Evans. London Irish Wild Geese had kicked themselves into a 6-5 half-time lead, but Barum’s two tries in either half clinched a fourth win of the season for Steve Perry’s men.